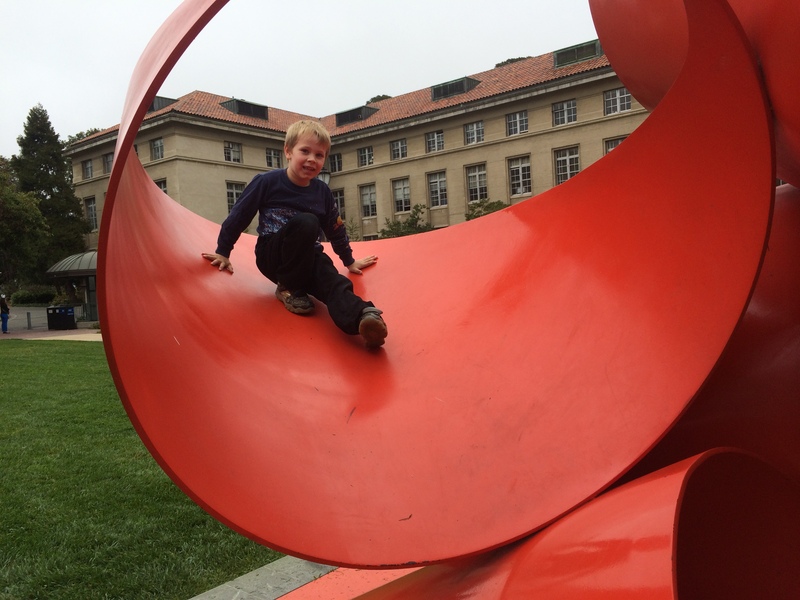 My son is off school for two weeks — then he starts Kindergarten. I took him to UC Berkeley today, to the Bioscience and Natural Resources Library where I myself used to work back in the late 1990s. 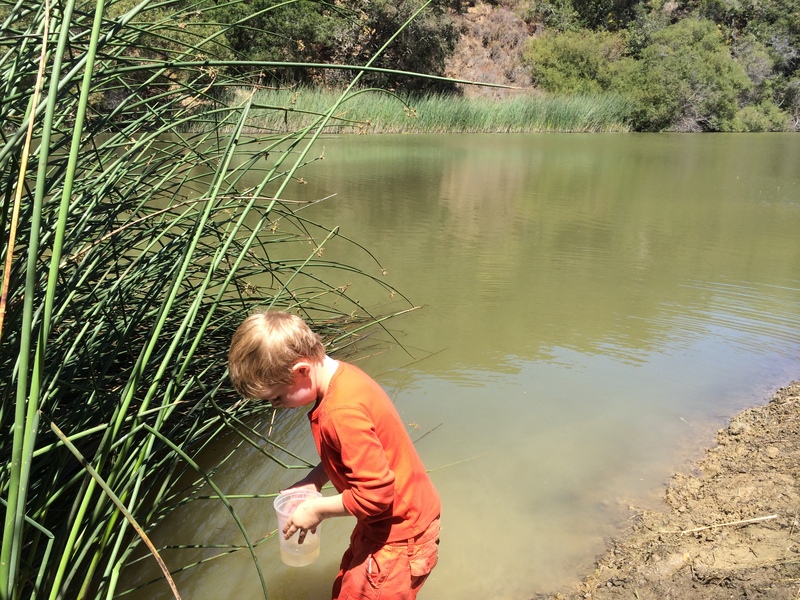 My main goal as a father and teacher is simple: to evoke wonder and amazement. I didn’t make up that idea myself. Years ago a teaching colleague of mine used those words to explain why he assigned Brave New World to high school sophomores, when some parents thought it was over their heads. 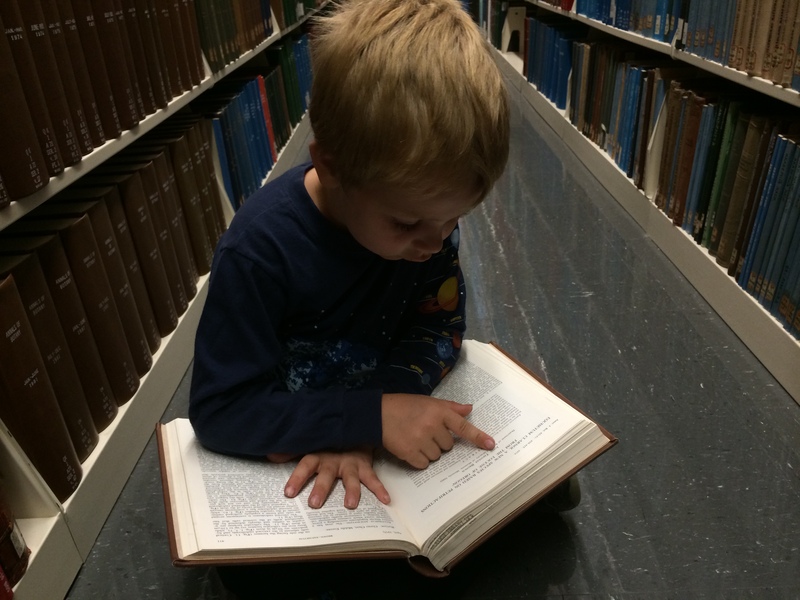 For all I know, the academic research library may be a rare thing by the time Kieran gets to university. See my published works here and here for more on that subject. I once interviewed a Stanford business school professor who said frankly that he never used the library. But hey, that’s Stanford. Don’t get me started. 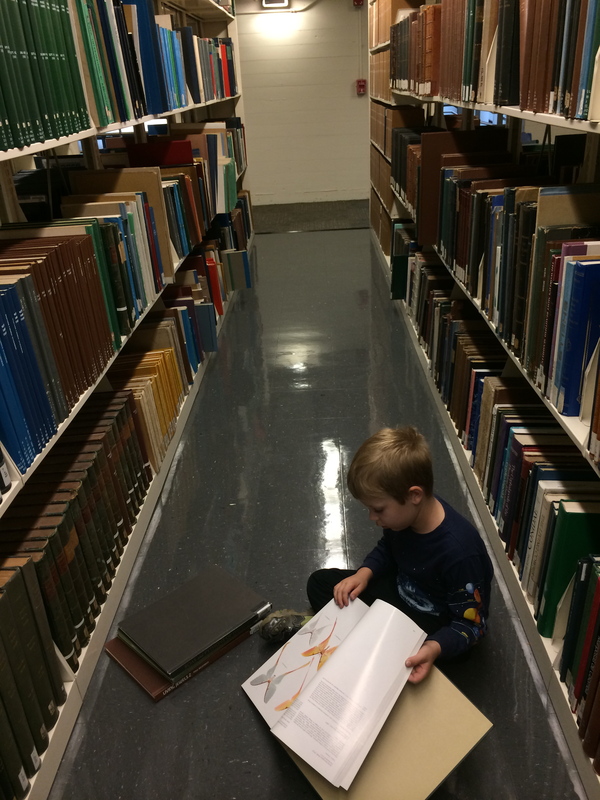 But I wanted Kieran to get a sense of all the amazing stuff in a university library, even for a little guy like him. 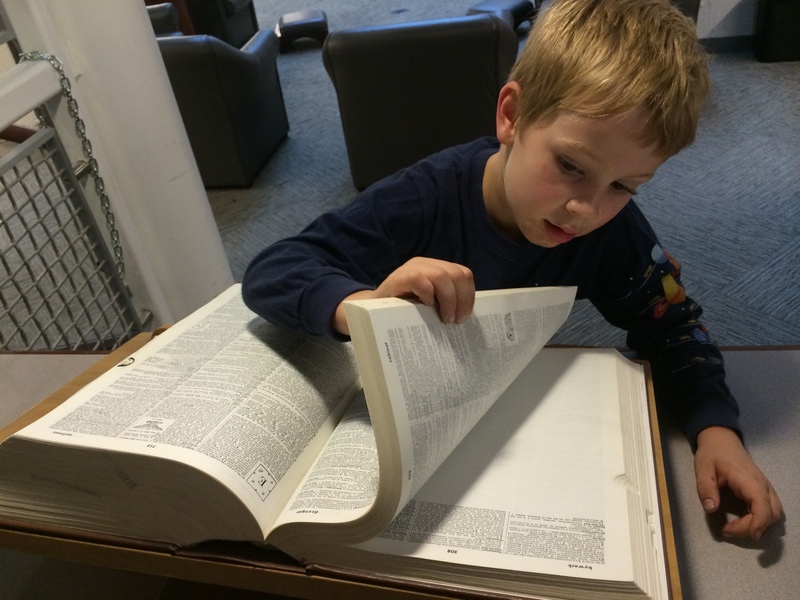 We started by looking in a huge dictionary (he looked up the word beetle, big surprise) and then we went up to the top floor, where the oversize books are kept. I told him I would check out any three books he wanted, but he was so dazzled by the selection I upped it to four. 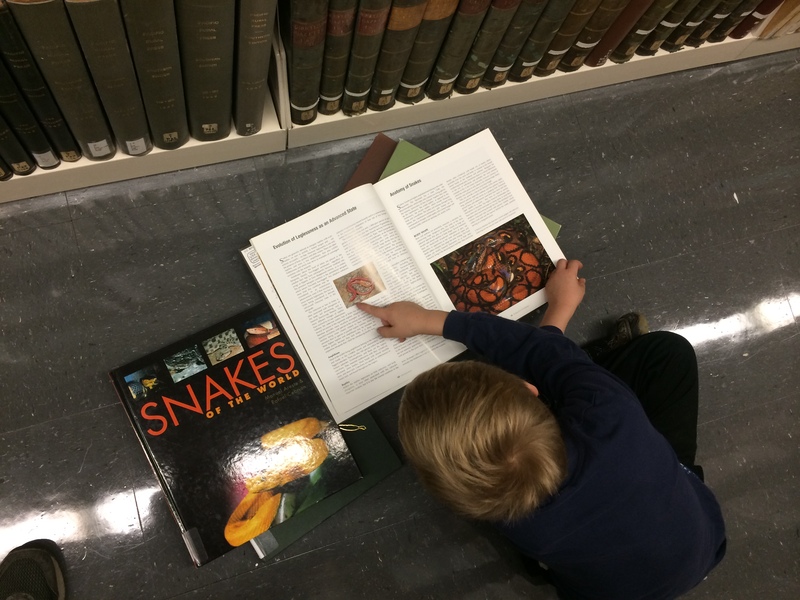 We looked at all sorts of stuff — he was astonished, for example, to learn that someone had written an entire book on corals! An entire book on them! 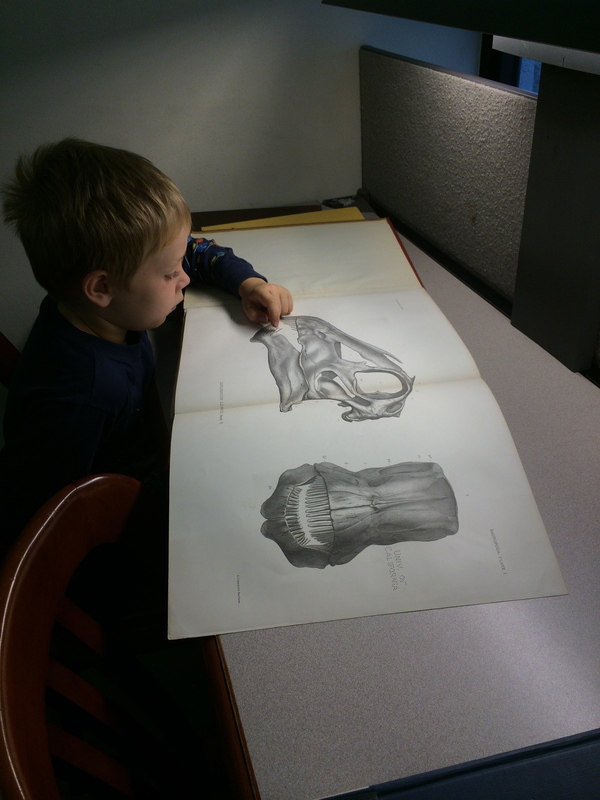 We looked through Othniel Marsh’s huge book on the Diplodocus, which has enormous, fold out leaves showing some of the bones at large scale — not quite life size, but big, big, big! Kieran counted the teeth of the Diplodocus in one of the fantastic drawings. 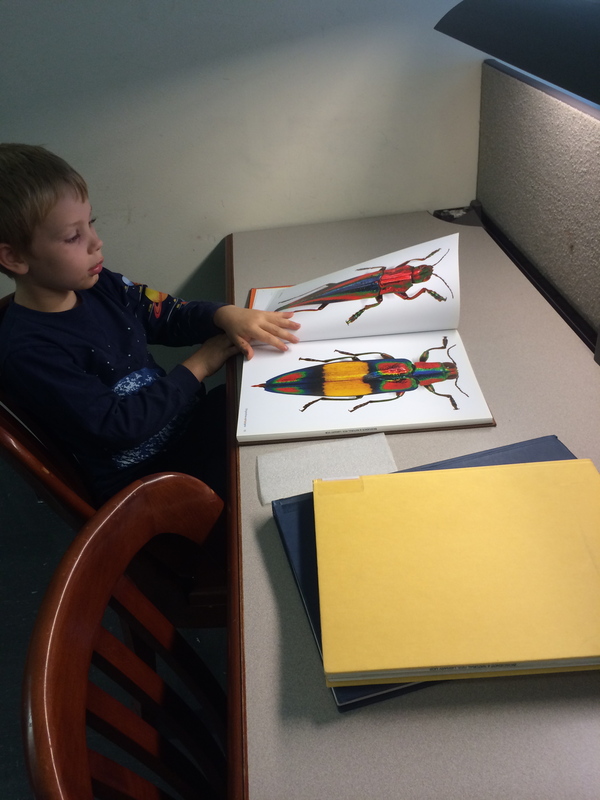 At last he chose two books on beetles (one focused on Apionidae), one on mammoths, and one on colorful poison frogs of the tropics. Then I took him downstairs again and showed him how to search the online catalog to find an article his grandfather wrote. In 1975 my father described a new species of Equisetum from fossil roots he found in Oregon. We looked up the reference, then went and found the bound volume of the journal. Kieran read the title and was excited to see his grandfather’s name on the page. “Papa wrote this?” he said to me in amazement. Its Amer. J. Bot. 62:410-415, year 1975, for anyone who’s interested. 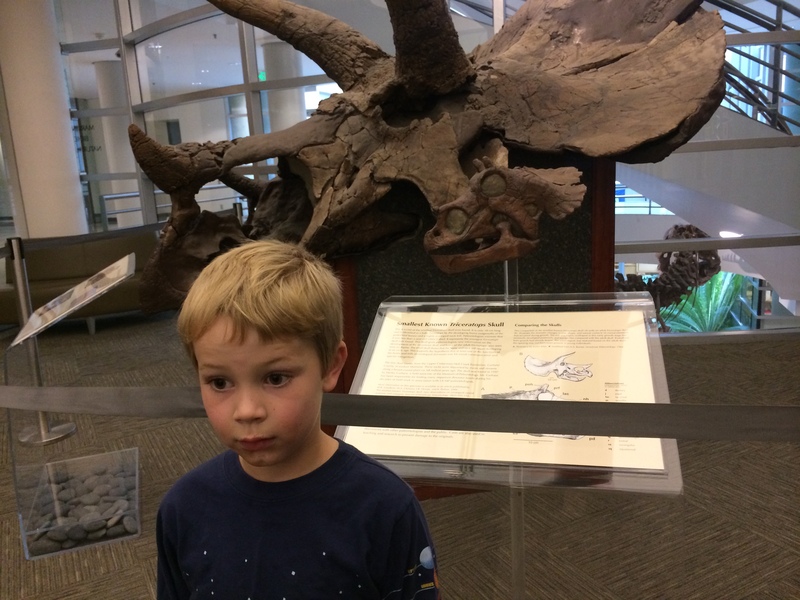 The library has Triceratops skulls in its lobby. So many books, so little time! 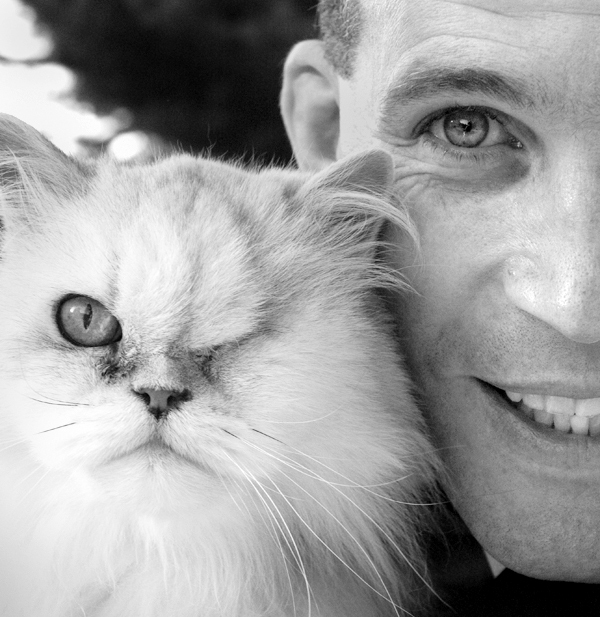 He would’ve brought them all home if he could. 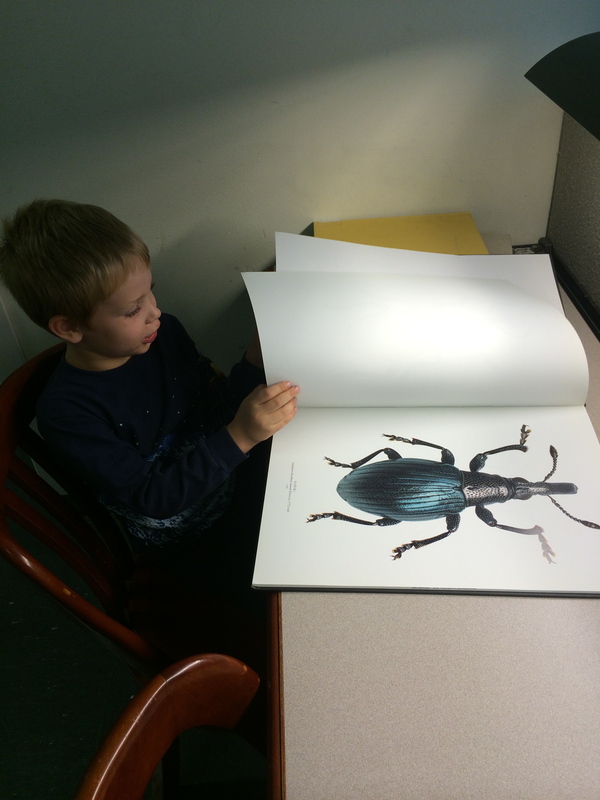 One of the oversize books on beetles. Counting the teeth in a Diplodocus skull. Counting human teeth (and checking the two of his that are loose). 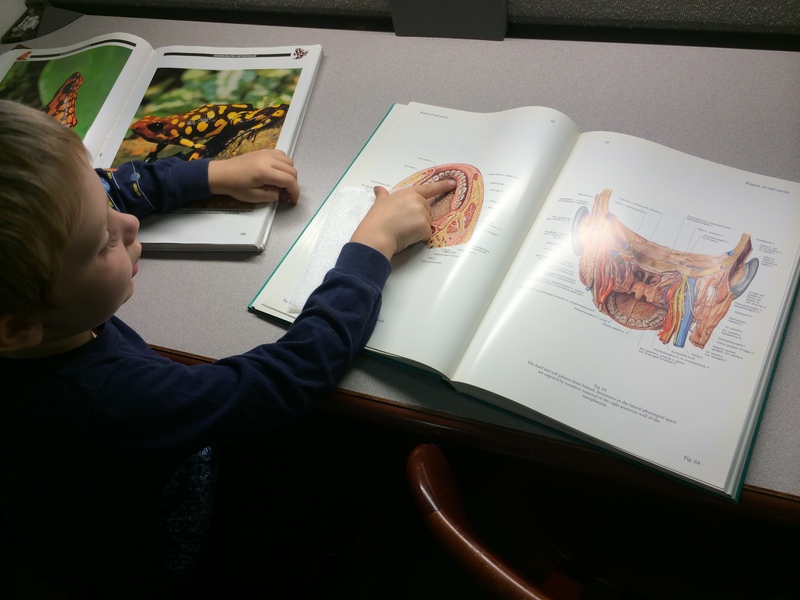 Reading his grandfather’s paper in the American Journal of Botany. Back outside on campus, I exposed Kieran to some art, and he decided to truly appreciate it he had to climb it. It’s important to combine library research with field work, and soon we’ll be back in the field! 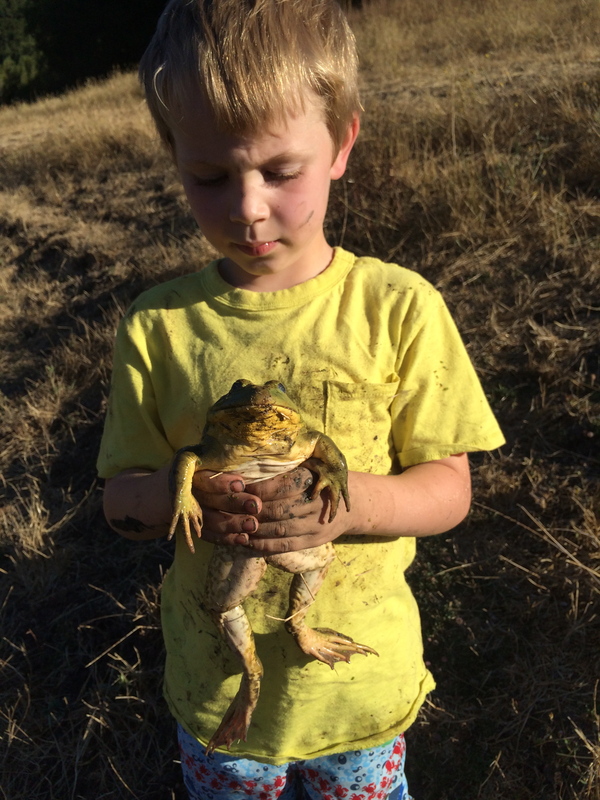 Sunday evening we caught Rana catesbeiana in Briones. Now you see him! 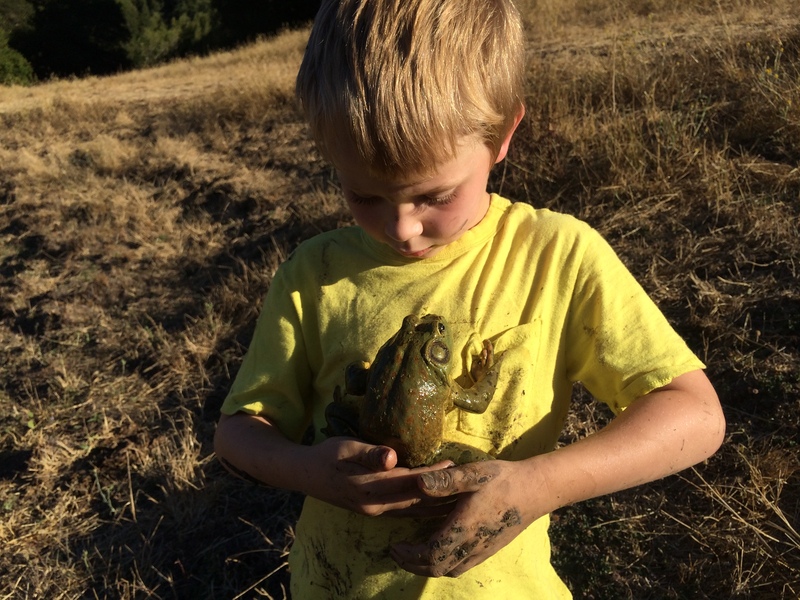 We also did some field work over the weekend at Water Dog Lake in Belmont. 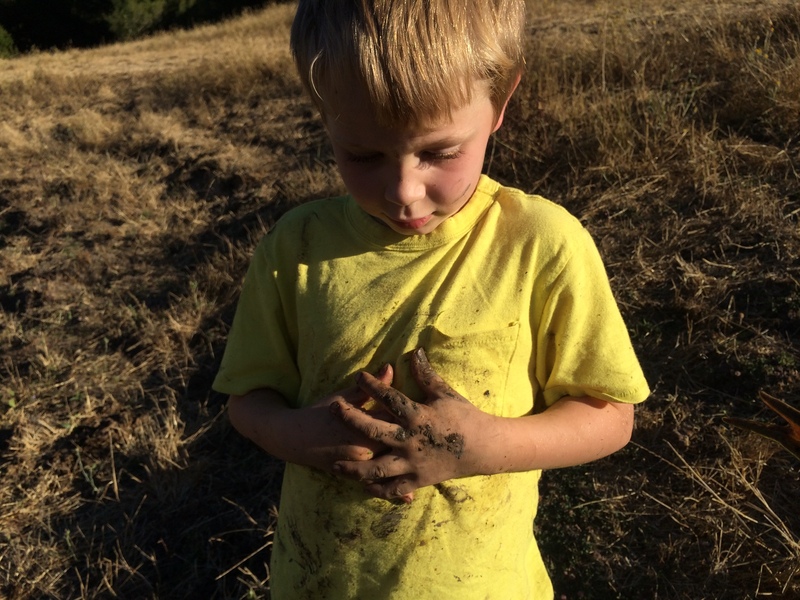 Good and muddy.